April | 2014 | We Can't Hear the Mime! David Wain has teamed back up with Paul Rudd and Amy Poelher for this giant send up of rom-coms. Wains script swings from slapstick to smugly self-aware and back again every other minute. This really rather confuses the mood of the piece since beneath all the neurotic sarcasm there is a genuine love story being told. Set in Manhattan like many rom-coms before it They Came Together features New York as “almost another character” in the story, a joke that is repeated over and over but is never substantiated in the plot. Every scene is a new set of gags and a new group of films to be mocked but it never seems to quite get past being irritating. Parts of it will be hysterically funny but then you cut back to the cheesy framing device full of done to death meta jokes. Perhaps if this secondary narrative level was actually serious it would make more sense. This dinner scene is set up as “the real world” where the story is being told but it’s just as smug and stupid as what is being mocked in the romanticised story. The humour pulls from Woody Allen’s self-depreciating irony in many places but the problem is that beyond the jokes there is nothing. While you’re watching it is funny, it carries you along but it’s a kind of brainless, instinctive laughter – more like being tickled for the duration of a film rather than genuinely laughing. There’s no social comment or even cinematic comment, it doesn’t criticise anything about the tropes it exaggerates and it almost seems redundant to be telling us “films don’t represent real relationships” in this day and age. This concept becomes clear about 45 minutes into the film and then you’re just watching it carry on, wondering if it will ever go there and laughing at the same old absurdist humour as you were shown in the first five minutes. This entry was posted in Film Reviews, Sundance London 2014 and tagged Amy Poelher, Comedy, David Wain, Film Review, Paul Rudd, Rom-Com, Sundance, Sundance London, They Came Together on April 30, 2014 by Flo. Recently, when Archive found that they had five tracks that did not fit on their most recent album they decided that the best thing to do was to make these five tracks, forty minutes in total into a short film with the help of Spanish film collective NYSU and director Jesus Hernandez. I’ve liked Archive’s music for a very long time and so I was intrigued and excited about this new project. Axiom is the portrait of a city, a dystopian island commune to be precise. It feels a little like a cross between Brave New World and Jonestown in concept. The citizens are locked away in cells to avoid the sound of the bell that keeps the city alive. Despite being essentially an extended music video Axiom does have dialogue and a plot, although the latter is very convoluted. It’s very atmospheric, although I don’t recommend it for the squeamish – some sequences can only be described as gratuitous and deeply disturbing. I’m not sure the endeavour is a great success. The film is presented in Black and White, but both ends of the spectrum are absent, as if someone equalised it out to the blandest greyscale you can imagine. It’s an odd tension because the plot seems to distract from the visuals and vice-versa but neither are that great. Generally speaking Axiom takes a lot of mediocre filmic ideas and combines them into something that is more odd than profound. It does stay in the mind, if only for the themes of oppression and control that are expressed so vividly. Structurally the film follows the song progression and divides itself into chapters, this works to an extent. Chapter one is more of a prologue than anything else but that can be forgiven. Chapter three however, seems to be entirely devoid of any link to the rest of the film. The visual ideas don’t link back to any other point in the film and it has no clear context in the world that has been created. It does serve to be very, very creepy, but the tyranny of a madman that was established in chapter two had already done that. It’s hard to say whether the problem lies in the track being too far removed from the others or with the director for not properly integrating the concept, either way it serves as a microcosm for the film. Powerful, creepy and odd but clumsily realised and by no means an artistic revolution. This entry was posted in Film Reviews, Sundance London 2014 and tagged Archive, Axiom, Jesus Hernandez, Music Video, NYSU, Sundance, Sundance London on April 30, 2014 by Flo. Ryan Coogler’s film actually premiered at the Sundance Festival in Park City, Utah in 2013. Despite winning the Grand Jury Prize and the audience award it failed to make it’s way across the Atlantic on its own and so the Sundance Institute brought it over for Sundance London 2014. Fruitvale station deals with the shooting of Oscar Grant III who was killed by a police officer on the 1st January 2009. The film chronicles his last 24 hours. While institutional racism and police brutality are always hot cultural issues it seems more than serendipitous that the film was released in the States a mere two weeks after the controversial Zimmerman trial, a case which also dealt with a debatably racially-motivated shooting. Coogler’s film is undoubtedly beautiful to watch, featuring some good old-fashioned 16mm film and trademark grain. It’s as romanticised as an image of a girl in raybans dancing in the sunset. Many of the events in the film are, as one would expect, completely fictionalised and they paint Oscar Grant as a loving, reformed, family man. A good glaze of nostalgia and forgiveness is thrown over such incidents as him cheating on his long-term girlfriend and mother of his daughter, his past arrest for owning illegal firearms and his violent and threatening behaviour towards a former employer and his involvement in drug dealing. What is achieved by giving us a candy-coated hero in place of the real man? No one should ever be shot illegally by a police officer. The presentation of the victim as largely an all round good guy is designed to tug at the heartstrings. As a result the film starts to feel like a protest campaign, demanding justice for Oscar Grant III and further demonisation of the police force. Coogler wants to open a dialogue about this incident but ignores one of the main issues – the appallingly widespread use of firearms. It’s a far less palatable and fashionable discussion, but in tackling real-life events some degree of respect for the facts must be present. The verdict reached on the Grant case, like the Zimmerman trial after it, does not imprison the shooter for murder. Coogler suggests that this is an unjust and racist verdict, despite the official plea being that Mehserle, the officer in question, mistook his pistol for his Tazer, and the testimonies of eye-witnesses that Mehserle said he was about to Tazer Grant moments before he fired the shot. Surely justice for Oscar Grant III would be to question why it is that a transport police officer was armed with a pistol in the first place? It would have been daring and revolutionary to question the culture that allows the possibility of a tazer and gun being confused and to result in such accidents. However Coogler ignores this issue, focuses on the now familiar theme of the perpetually oppressed, and appears to cry racism. Interestingly, in Fruitvale Station, Oscar Grant III is shown as a well rounded human, the kind of man who saves dying dogs, loves his young daughter and throws away a bag of weed in a symbolic act of the reformed character. The casting of Michael B. Jordan as Grant is accurate and sympathetic. However Mehserle, who is of German descent, but has dark hair and eyes, is cast as a pale, blonde blue eyed man quite unlike his real-life appearance. If anyone is guilty of negative racial stereotyping it is the director. It’s a difficult film. It’s beautiful, enjoyable and flawlessly realised. Technically I cannot fault it and as I watched it I was pulled along on this wave of emotion. As time goes by I find myself more and more disturbed by the blatant emotional manipulation employed so skilfully to promote a troubling ideology. Not all victims are martyrs and not all police are racist thugs but unfortunately these tropes are becoming all too acceptable in our media. This entry was posted in Film Reviews, Sundance London 2014 and tagged Film Review, Fruitvale Station, Melonie Diaz, Michael B Jordan, Octavia Spencer, Ryan Coogler, Sundance, Sundance London on April 29, 2014 by Flo. Over the last weekend I was lucky enough to attend the Sundance London festival. Sundance is all about listening to the stories that may not be heard. Sydney Freeland’s directorial debut is one of these stories, and that just makes it all the more beautiful. Following the lives of three Native Americans in the fictional town of Drylake, and the neighbouring Navajo reservation, Drunktown’s Finest is a fresh new face on the cinema scene. While Drunktown’s Finest deals most specifically with the modern Native American culture it also contains three deeply personal stories that are universal. The struggle for balance, be it between past and future, between who you are and how you are seen or even just between instincts and reasoning. The three lead performances documenting these struggles are all fantastic. However, Jeremiah Bitsui (SickBoy) seems let down by a slightly weaker character arc. SickBoy’s character is almost entirely objectionable and lacks adequate change or redemption, getting by through the kindness and forgiveness of others. He’s a little further removed from the heart of the film and ironically it seems that the film is balanced a bit too far in his direction. That being said, newcomer Morning Star Wilson lights up the screen as adopted Christian Nizhoni. Her demeanour is perfectly placed in the realm of the teenage paradox, a proudly independent force still desperately in need of community and acceptance. Her performance is charming and raw in a demanding role. Our third protagonist, Felixia, a transgender woman trying to make it as a model is played by Carmen Moore, herself a transgender model and a Navajo woman. Her performance never misses a beat here and she has stated that many of the situations shown in the film reflect the reactions she experiences every day in regards to her identity. It’s a surprising and interesting voice to find on screen and the surrounding LGBT issues are handled with sensitivity and respect. Freeland avoids politicising the film on this issue, instead focusing on the importance of self-acceptance for everybody through the lens of someone who is struggling for their own reasons. Ultimately that is the magic in Drunktown’s Finest. Freeland has touched upon and opened up a dialogue on topics ranging from religious diversity, LGBT acceptance and the struggle of Native Americans in today’s society without creating something that feels like promotion or propaganda. Drunktown’s Finest is uplifting and enjoyable and life-affirming, quite apart from being beautifully shot in some spectacular landscapes. It gives us a window not only into the three protagonists, but into their culture, which is itself struggling for unity and acceptance in the modern United States while holding on to a rich cultural heritage. This entry was posted in Film Reviews, Sundance London 2014 and tagged Carmen Moore, Drunktown's Finest, Film Review, Jeremiah Bitsui, Morning Star Wilson, Navajo, Sundance, Sundance London, Sydney Freeland on April 29, 2014 by Flo. 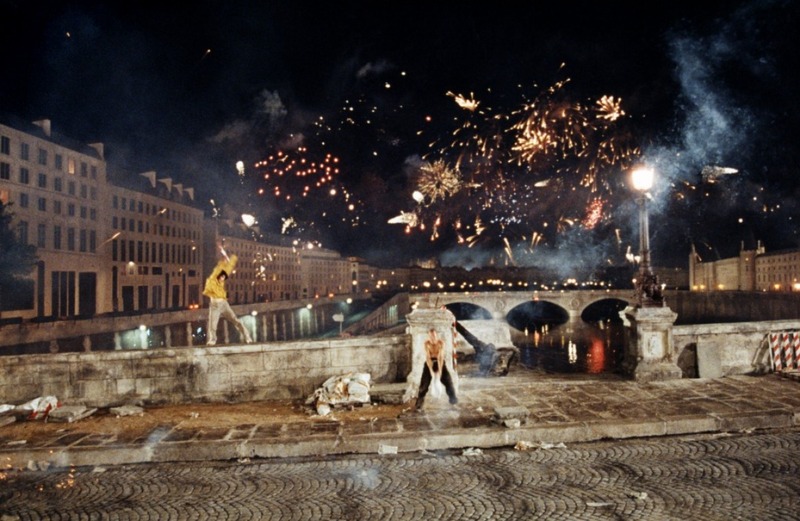 Set on what can be argued to be the most distinctive bridge in Paris, Leos Carax’s film captures a fleeting moment in time for all of us to consume. In 1990 Pont Neuf was dilapidated and closed for repairs. Against this backdrop, although not actually filmed on the bridge itself, we meet two people, both equally dilapidated. Michèle (Juliette Binoche) is an artist losing her eyesight and running from her marriage. Alex (Denis Lavant) is an aggressive alcoholic. The only thing these two have in common is their misfortune and their home sleeping rough on Pont Neuf. Carax’s camera refuses to be bound to a classic narrative style. At times we are seeing the world through Michèle’s eyes. Fireworks and lights appear in painful high contrast flashes. Over-stimulating her eyes and the viewer. Later it feels like a music video, the soundtrack ramps up into cynical electro-trance tracks as the characters seem to dance. It’s an almost painterly treatment of the subject matter. There are entire sequences with no dialogue that show us more about the relationship than some films ever achieve. The camera has been utterly freed here and it creates a shockingly anti-narrative result. While the plot does move forward it seems to be just a coincidence of time passing. Les Amants du Pont Neuf is a collection of moments in a love affair, the ones that are remembered for years to come. The central theme is one of rebuilding. We enter a world that is harsh and gritty. The hospital is less welcoming than the street here. It’s a terrible snapshot of life for the homeless of Paris. As the film progresses it starts to get better. The bridge itself is still in ruins but Alex and Michèle seem to improve, they earn some money and even manage to reintegrate into society a little. When the bridge, and everything else, is finally whole it seems impossible that they are the same people who we saw before. The camera seems to capture two completely average people, and you wonder whether they have been neutralised, normalised by the passing of time. Is that all that humans really wish to do? To regulate the actions and emotions of everyone around us, fix them all up to be more pleasing to the eye? It certainly seems to be the case in Carax’s interpretation. Whatever is not beautiful is rejected in this world, and those that can see clearly will naturally never stoop to what is less than perfect. Carax never allows his style to become self-important. There are echoes of the old greats of cinema at all the most poignant moments, even Singing in the Rain gets an allusion. All the beauty and all the rule-breaking is informed by a knowledge of how to communicate through the lens. It makes for a deeply moving film, even when you can’t yet understand its significance or meaning. This entry was posted in European Screen, Personal Screen and tagged Daniel Buain, Denis Lavant, Film Review, french cinema, french film, Juliette Binoche, Leos Carax, Les Amants du Pont Neuf, The Lovers on the Bridge on April 24, 2014 by Flo. Inside Llewyn Davis sparked controversy this year when it won the Gran Prix at Cannes but was almost entirely snubbed by the Oscars. I’ve never been a huge fan of the Coen Brothers but I was very curious about such a polarising film. It always interests me when the cinema authorities can’t seem to make their minds up. However I have to side with the Academy on this one. 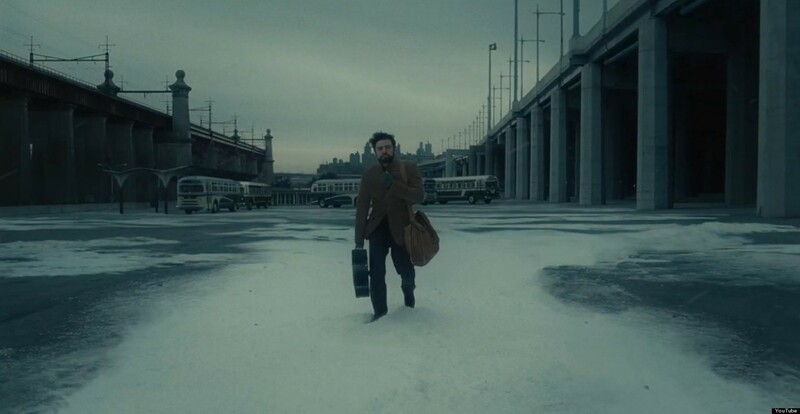 Inside Llewyn Davis appears to be, unapologetically, the story of a self-absorbed, untalented, selfish loser. There’s really nothing good about this character. Oscar Isaac gives a great performance and makes him as entirely unsympathetic as he is written. From the beginning to the end Llewyn is rude, presumptuous and bitter. He can’t get through a night without heckling one of his rival country music acts and has a huge victim complex when he gets beaten up for it. He’s the type of guy who loses someone else’s pet, lies about it and then shouts at them. A top class human in all respects; by about halfway through the film I was rooting for him to give up his musical career and leave for good. The other characters aren’t hugely better, Carey Mulligan plays Jean, one half of a scrubbed up folk act that’s far more successful than Llewyn due mainly to Jean’s tight sweaters. She’s belligerent and refuses to take responsibility for her actions, even when she clearly became pregnant through her own volition. Together the two are more sour than lemon juice that went off three years ago. I’ve read that this is meant to be a “love letter to folk music”. All I can say to that is that if this is how the Coen brothers show love I sincerely hope they hate me. Their portrayal of the 1960’s folk scene is a series of ever-dingier locations filled with the most unpleasant people the world has ever known. Failure is inevitable in this world and everyone’s cynical and doomed anyway so why are they trying? I know that I’m meant to feel sorry for Llewyn, after all he’s a struggling artist who’s best friend committed suicide, it’s just that he’s written to be such a horrible person that you can’t muster up sympathy. In fact I feel more sorry for the guy that used to have to spend time with him. This entire lack of pathos makes the film very boring. You spend all your time hoping that Llewyn will at some point have a redeeming quality or do something that doesn’t fall into the category of whining or upsetting other people. He doesn’t, and it’s an awfully long wait. By the time the final scene rolls round and Llewyn has grown so little as a character that simply repeating the opening scene is apparently an adequate ending – it feels like torture. Not only have you seen this guy be unpleasant for what feels like three hours but the Coen brothers literally rub your face in how little has happened by forcing you to sit through the same lacklustre and miserable folk performance. The production design was nice I guess. This entry was posted in Cutting-Room Floor, Film Reviews and tagged Carey Mulligan, Coen brothers, Ethan Coen, Film Review, Inside Llewyn Davis, Joel Coen, Justin Timberlake, Oscar Isaac on April 5, 2014 by Flo. 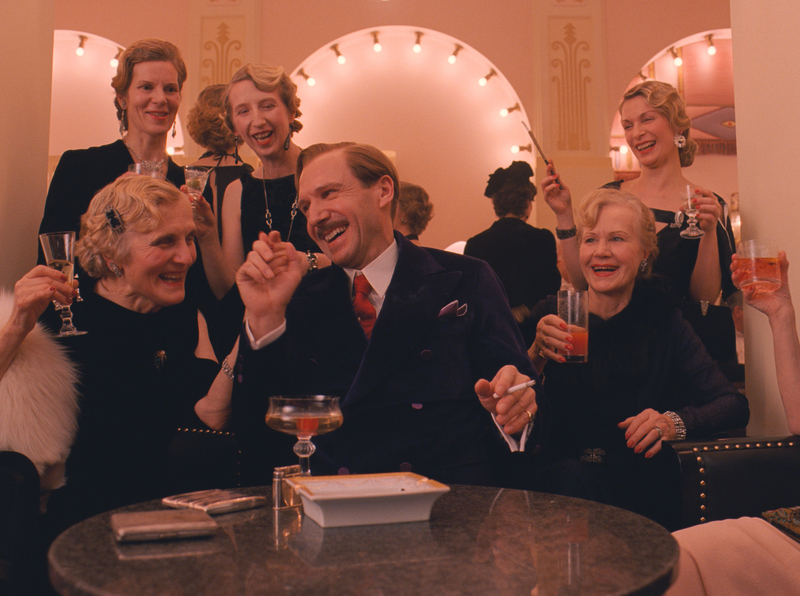 Wes Anderson’s newest film is full of pastel-pink dollhouse glamour, as always. At the beginning of the film we see a girl reading a book entitled “The Grand Budapest Hotel”. We then cut, and change aspect ratios to an author, who is being told they story that would later become the book the girl is reading. Cut again and we’re even smaller on the screen and starting the primary action: The Lobby Boy’s account of the story that happened to the Concierge at The Grand Budapest Hotel. The story which would later become the events he told the writer and were made into a book that a girl is reading. Confused yet? The film cuts between these two layers, the older man’s narration and the story he’s recounting, the whole way through. It’s interesting to see the use of aspect ratio, a largely ignored cinematic affectation until recently, but it cuts off the emotional thrust of the story since it feels like we are seeing it at least third hand. It’s hard to relate to a story told from such a great distance, even when it’s set in the same location only 30 years previously. It seems to me that the film would be more successful if it just told the original story. The story of Monsieur Gustave (Ralph Fiennes) and his inexplicably adopted protégée Zero (Tony Revolori). Both of these two give fantastic, tongue-in-cheek performances tinged with deep melancholy. Fiennes is dynamite, exuding effusive, camp wit through his very body language and Revolori matches him, grounding the characters and providing the audience with a lens. Through Zero’s eyes we see the obsessive, sycophantic M. Gustave entirely positively. Despite all his flaws we only see him as flamboyant and refined, a relic of a greater age, when elegance ruled the land. The farcical nature of his whole world is revealed through the name of the fictional European land we find ourselves in, Dubrowka, which is, in fact, a brand of flavoured lime green vodka -A ridiculous indulgent frippery akin to the hotel at the centre of this film. This candy-floss pink world is set against the unfortunate backdrop of war, both past and future. In a Europe still recovering from the loss of a generation it seems fitting that an old hotel finds that all its clients are dying and no new ones are appearing. In the midst of a Nazi invasion it’s natural that the luxury and decadence wouldn’t survive. None of the magic of the hotel survives, not M Gustave, not the sweet romance that Zero finds there, not even the whimsical building. War and politics strips the world of its beauty and intrigue and all that’s left is a book and an old man in a decrepit hotel. It’s very strange, Anderson went from Moonrise Kingdom, the moving-image fairytale to this, an assertion that time is fleeting and all the best things will disappear, only to be remembered in tiny 4×3 snapshots. The real world is much larger, and much more brutal, it surrounds us in widescreen making the dingy colours and indifference all the more upsetting. Wes Anderson films have always been full of the kind of cinematography and visual wit that makes the world seem like a better place. The Grand Budapest Hotel is no exception and it’s entirely possible to find yourself giggling along with many of the scenes based purely on their whimsical, witty and perfectly calculated design. Anderson is, in his own way making the cinema into a hotel where he can create the perfect world during our stay. This entry was posted in Film Reviews, Personal Screen and tagged 2014, Adrien Brody, Bill Murray, Edward Norton, F. Murray Abraham, Film Review, Jeff Goldblum, Mathieu Amalric, Ralph Fiennes, Saoirse Ronan, The Grand Budapest Hotel, Tony Revolori, Wes Anderson on April 2, 2014 by Flo.